This is what I look for in a vocal performance when I’m recording. I put it in order of degree of difficulty to “fix in the mix”, 1 being impossible to fix and 7 being easily fixed. You have to realize that every vocalist, song, and situation is different so there is no right or wrong way to record vocals but these are things to be thinking about when you’re recording a vocalist. No-one has designed a plugin to replace or fix human emotion, yet, and I hope I’m long gone by the time they make one. Some singers just haven’t spent the time thinking about the vibe or attitude of their song until after their first warmup take and then all of a sudden they discover there is a meaning to their song, imagine that. To me this is one of the biggest differentiators between successful singers and everyone else who tries to sing, professionals know they have to tell a story with the song and communicate their emotions to the listeners. This is also why demoing a song is so important, it gives you a chance to hear the song more objectively and make sure the vibe and character of the vocal performance matches and enhances the song. Are you singing words? Do you like the words you’re singing? Do you want your listeners to like your lyrics? If yes, then please help all of us out and make your lyrics easy to hear (or really hard to hear if that’s more your vibe). Diction (enunciation, pronunciation or articulation) is something very critical to having a great vocal on a song, and just like emotion there isn’t an easy way to fix it later. If you’re working with a singer that has less than stellar diction it can be difficult to change their habit on the spot. That’s another reason for doing more pre-production, if you can realize early on that an artist needs to work on pronunciation you can spend time in rehearsals working on it rather than in the recording session. While it’s not hard to nudge vocals around in the DAW, it is harder to get them in the pocket by means of editing than by performing them in the groove. There are too many things in life that I enjoy doing more than sitting at home and locking vocals to the rhythm section. If the groove doesn’t feel good right away, I’ll do another take to get it right instead of taking whatever I get and then have to spend an hour or two later correcting it. Vocal tone can be manipulated by EQ to a certain extent, but there’s only so much it can do, it can’t make a loud, belting chest voice sound like a soft, airy whispery tone. The voice is arguably the most dynamic instrument we have to record, not just in volume but also the range of tones that can come out of one person. The tone and intensity that a vocalist uses also has a lot of influence on the emotion of a song, but most songs don’t just repeat the same line over and over again, as the song moves along always be checking that the tone is enhancing the vibe not distracting from it. These are the only ones the engineer has real control over. If you hear certain frequencies ringing out or dominating, it could be the mic or maybe even the position of the singer in the room. Although these resonances are easy to fix with an EQ, it could also be as simple as a little adjustment of the mic placement (if you haven’t caught on yet, I hate fixing things in the mix). Also be aware of the distance between the vocalist and the mic, too close can be boomy and unnatural, too far can be roomy and less clear sounding. I don’t have a rule for distance but usually like to start with about 12 inches or so and adjust from there. If you hear distortion on the vocal and your immediate reaction isn’t “wow that’s cool, that crunchy vibe is killer” then maybe think about taking a minute to adjust your gains. Even if you’re not clipping in your DAW something in your signal chain is unhappy and you should lower your level going into it to make it happier. There is no undo for recording a distorted vocal. When I get tracks to mix with distorted vocals I generally can’t do much more than either tame the harshness and mask it with effects or I take it even farther and go completely nasty (which works great most of the time). Sibilance is easy to fix with plugins, it’s also easy to fix before the mix. 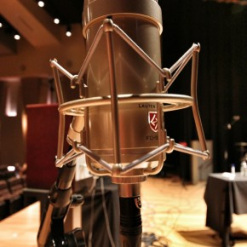 Try pointing the mic 10-20 degrees down from a singers mouth, if that doesn’t work, maybe consider throwing a different mic up; just because it’s your most expensive mic doesn’t automatically mean it’ll sound good on everyones voice. There are some singers out there that have fantastic (nearly flawless) pitch control. There are some singers that have absolutely no pitch (most of which are on TV these days). And there are a majority of singers that are pretty good, but sometimes are a little pitchy or have to sacrifice pitch for emotion in places. I’ll take a pitchy performance that’s emotional over a soul-less pitch perfect vocal any day of the week. It’s scary easy these days to fix up a few less than perfect notes using Melodyne or Auto-Tune, that’s why it’s so low on my check list, I’d love to have everything but if I can get everything sounding great but the pitch isn't perfect, I’ll spend the time fixing it up (or not fix it if the looseness of the pitch adds to the vibe). Volume is whatever, every DAW has automation nowadays. As long as there’s no distortion and the intensity of the vocal is right, the actual volume of what’s recorded doesn’t matter. Aim for the sky and be happy if you end up on a tropical island. Not every vocal is going to totally perfect, but it’s the imperfections that make them unique so embrace them. Vocalists are humans, not machines so always use your best judgement and be sensitive when giving feedback, there’s always a nice way to address problems while tracking. Next time you’re recording vocals, think about these things and find a good balance between them keeping in mind that sometimes you may have to sacrifice one for another, like pitch for emotion or groove over diction.